A Martha Stewart recipe, found via Pinterest. I pinned it because: coconut. chocolate. 4 ingredients. Need I say more? In a food processor, blend together the butter and half of the coconut, until it forms a ball. Scrape down the edges and pulse in the remaining coconut. Turn out into a 9" pie plate, and press to form a crust. (I found a wide, flat bottomed glass helped with this step.) Cover the edges with foil and bake in a 350° oven for approximately 15 minutes, until the center begins to brown. Remove the foil and bake about 5 more minutes. Over medium heat, bring the cream up to heat, just below a boil. Pour into a heat-proof bowl, over the dark chocolate. (The recipe recommended 61% cocoa, I used 70%.) Let sit for 10 minutes, then carefully whisk until smooth. 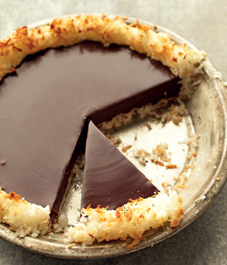 Pour the ganache into the crust and refrigerate for at least 1 hour, up to 24 hours before serving. My pictures aren't that lovely because my plastic wrap fell onto the ganache. Also, the crust was a little hard to get out in one piece. The crust was delicious, you could definitely eat it on its own. My mom said it was like a coconut macaroon. The chocolate ganache was so creamy and silky, it was heavenly to eat. We served with a healthy dollop of the remaining heavy cream, whipped. Go big or go home, right? Disclaimer: not diet friendly at all. I entered it in My Fitness Pal while making, and the stats are: 578 calories and 48g of fat per slice, when cut into 8 pieces. OH MY GAWD! I looooooove coconut and dark chocolate! I am sooooooooo making this! OMG hahaha...per slice!! There are some really good recipes for avocado chocolate mousse. I bet it would reduce some of the calories! Hi Christina. This looks so good, and I LOVE the disclaimer "not diet friendly at all". So worth it sometimes!!!! Have a great weekend. Holy moly coconutty!!! That looks gorgeous, Christina!! That looks amazing Christina - definitely insulin worthy! !